MEDIUM was a combined operation by the Royal Navy and RAF Bomber Command, in which an air raid on Cherbourg’s harbour was cover the approach of the battleship HMS Revenge and her escorting destroyers close enough to shell the port installations. The attack force would be screened to the east and west by other surface vessels. The operation was co-ordinated by C-in-C Western Approaches, involving ships from Plymouth and Portsmouth as well as Motor Gun Boats from Fowey (MGB’s 40, 42, 43, 44 and 45). Bad weather on the 9th led to a 24-hour postponement and that evening it was decided to attack at 03.30 BST on the 11th. The Navy’s decision to go ahead with the operation was signalled to the Air Ministry on the morning of 10 October. The RAF was to bomb Cherbourg in the hope that the Germans would not immediately recognise the naval shelling for what it was, offering the ships a better chance of retiring without being engaged by coastal artillery or E-boats. Blenheims of No. 15 Squadron were to attack the port in waves: four by moonlight, from 00.15–01.00; two from 01.30–01.45; two from 02.30–02.45. Five minutes later a 4–5 mile (6.5–8 km) line of flares, laid by two Wellingtons of No. 99 Squadron, was to silhouette the Gros du Raz lighthouse from the southwest, so that Revenge could fix her position accurately as she turned on to the final leg of her approach to the target. The Wellingtons also had bombs which they were to drop on the port from 03.15–03.30, after completing their primary task. All the foregoing aircraft were to carry a high proportion of incendiaries and get away before the shelling started although two further Blenheims were to be on hand to harass any guns that tried to engage the battleship. RAF cooperated and first started effective fires near the target area. Further fires were started by the bombardment by REVENGE and destroyers. The enemy at first believed that only air attack was taking place, and intensified his Flak. Later 13.5 inch guns opened up and continued fire until the returning ships were 36,000 yards away. The enemy’s firing was very accurate but none of our ships sustained damage. Last night 46 aircraft of Bomber Command successfully attacked the Channel ports and docks at Amsterdam and Rotterdam, and cooperated in Operation “Medium.” Coast defence guns were also attacked at Henneville..
Two aircraft took off from Newmarket at [00.45 and 00.48] to carry out co-operative operation with the Navy. Both aircraft landed safely from the above operation [at 05.43 and 05.47]. I congratulate all concerned on the very successful execution of last night’s operation. I am very grateful for the extremely efficient co-operation of Bomber Command, which was of the greatest value. SPREE was over 20 km from the focus of the bombardment, the harbour area of Cherbourg. Learning of its destruction six days after the event, Bletchley Park’s Cdr. M.G. Saunders noted that “AM [Air Minstry] and AY [Admiralty] know nothing about this” (see above). Examination of the two services’ records does however offer some clues as to what may have happened. 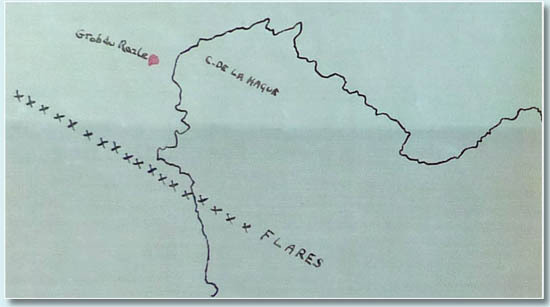 According to an Admiralty sketch map, the eastern part of the flare line extended overland, right across where we now know SPREE to have been. It must be acknowledged however that the map does not precisely match the coastline as it appears on satellite imagery, so an element of uncertainty remains. Nevertheless, illumination was to be maintained from 02.50–03.20 hours BST and the Germans reported three bombs falling on SPREE at 02.00 GMT, so the timings are a close fit.